When it comes to her style, Noomi Rapace does things her way. Yesterday(January 16th) in London, she attended the 'Close' screening at the 'Close' at The Mayfair Hotel. While many female celebs are stepping out more in power suits, this is a look that Noomi does quite often. 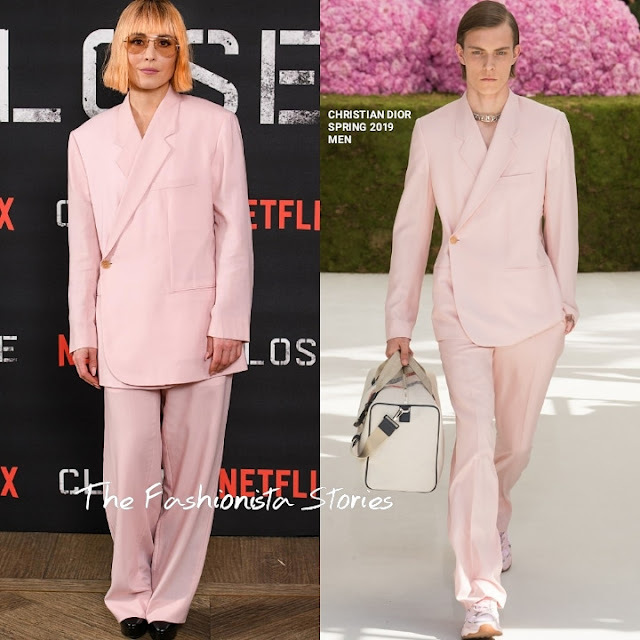 She chose a pink suit from the CHRISTIAN DIOR SPRING 2019 menswear collection. What makes this suit fresh, is the crossover, one-button jacket. However the pants needed to be hemmed and I would ditch those heavy black heels for a simple pump or sandals. Something on the neutral side, white or even colored. What do you think of Noomi's look?